This cute and lovely bunny egg crocheted basket will definitely add fun to the Easter festivities. Use it to stash your Easter goodies, or keep it year round to store knickknacks and whatnots! The pattern for this festive crocheted basket is an ideal project for intermediate crocheters. 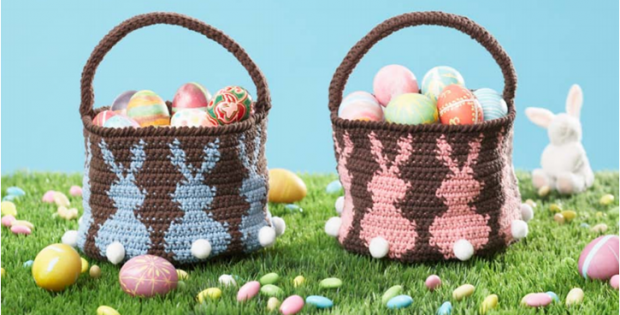 Once finished, the crocheted bunny basket should have a circumference of approximately 23 inches and a height of about 6.5 inches excluding the handle. In metric units, the completed egg basket should be about 58.5 cm in circumference and around 16.5 cm high. The pattern for this cute and festive basket is another creation by the wonderful team over at Yarnspirations. In fact, you can access the FREE downloadable pattern for this beautiful bunny egg crocheted basket from their website. To access the FREE downloadable pattern for this creative crocheted piece, please click on this link: Bunny Egg Basket Pattern. Featured image: Yarnspirations – thank you!